Niner’s Constantly Varying Arc, or CVA™, suspension design is a short dual-link, four-bar system unique to Niner, developed in house and patented. 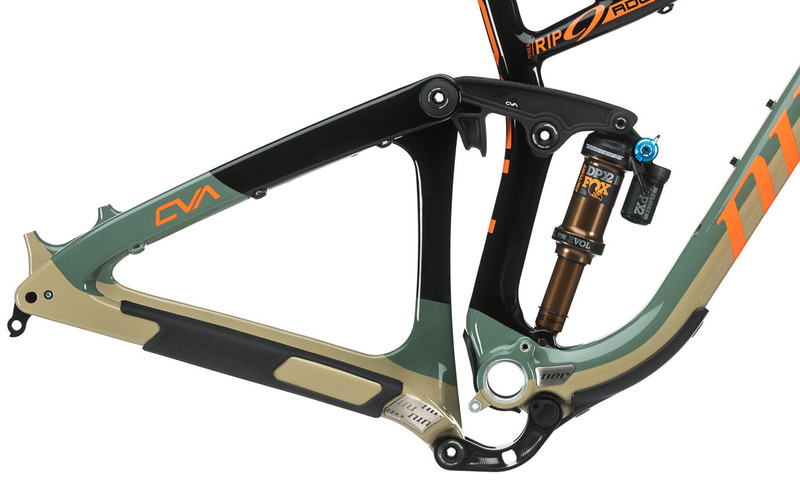 Originally designed specifically to account for the greater bottom bracket drop of 29ers, the CVA pivot and linkage layout is ideal for the range of larger wheel and tire sizes found on all modern trail bikes, including 29er, 27.5+, and new school, wider 27.5 wheels with 2.5-2.6 tires. In a nutshell, the CVA system controls unwanted suspension movement with calibrated anti-squat provided by chain force, rather than relying on rear shock compression damping or manual lockouts. At the same time, CVA keeps the suspension active while climbing and descending, thanks to careful pivot placement which effectively tunes the amount of bump input required to overcome the anti-squat. We believe the right tune is a balance between pedaling efficiency and fully active suspension. CVA suspension is perfectly balanced, so the result is stable yet supple, active, ground-hugging traction in every situation - cranking uphill, ripping downhill, and everywhere in between. Niner’s CVA axle path is important. 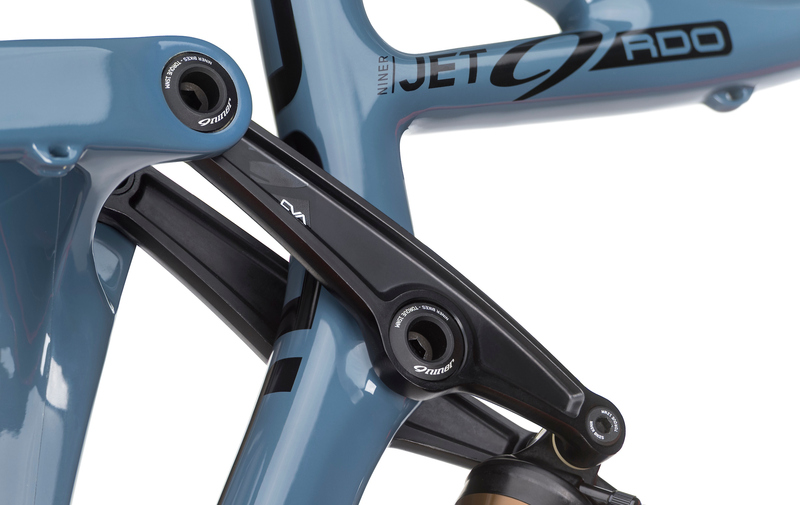 Thanks to this unique CVA rear axle path, Niner suspension bikes benefit from carefully controlled chain growth in the first 30% of suspension travel to impart an optimal degree of “anti-squat” force under pedaling loads. Chain growth: the effective lengthening (or shortening) of the distance between the bottom bracket and rear axle as the suspension cycles. Anti-squat: a measure of how the suspension resists pedal bob, or the tendency of suspension bikes to naturally move up and down under pedaling load, due to the rider’s weight shifting as the bike accelerates. Niner’s CVA axle path (and hence chain growth) is designed to maximize anti-squat right at the sag point, or within the first 25-30% of suspension travel. Chain tension from pedaling force helps to hold the bike up in its travel, right at the sag point, and prevents it from squatting or bobbing under pedaling load. Suspension sag or “sag point:” When properly tuned, where the bike naturally sits in its travel under the weight of the rider. Usually about 25-30% of total suspension travel, e.g., 2” on a 6” travel bike. Furthermore, thanks to our linkage and pivot layout, CVA anti-squat is amplified in larger rear cogs, which happens to be the gearing most used when a rider is pedaling uphill. This goes a step further in minimizing pedal bob and loss of efficiency, particularly when climbing. Yet the anti-squat stability is “overruled” by bump input, even going uphill. When bump inputs from terrain cause the CVA suspension to move past the sag point into travel, chain growth and anti-squat are reduced to near zero. This prevents pedal kick-back and keeps the suspension supple and active, so that the rear wheel stays smoothly in contact with the ground and the rider maintains traction while pedaling. 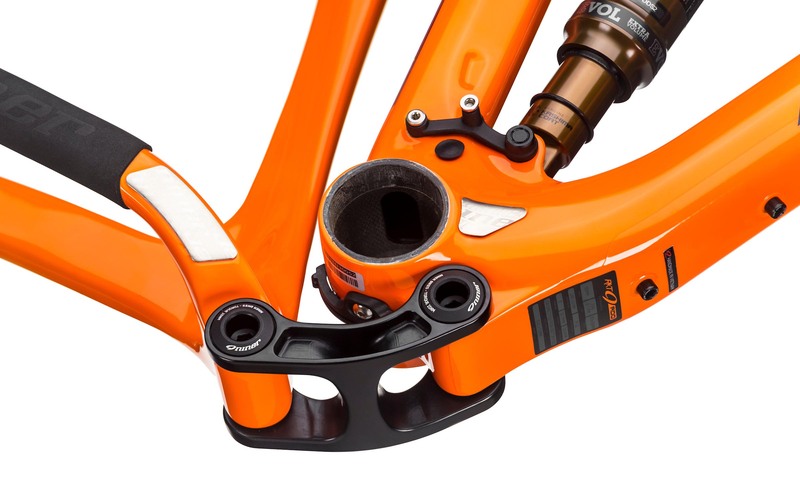 Pedal kick-back: backward rotation of the crank arms when the suspension cycles due to bump input. At the end of the day, CVA is stable yet supple under pedaling. It gives just enough anti-squat to maximize pedaling efficiency, but not so much as to cause the suspension to “stand up,” kick back, extend, or overly stiffen under pedaling inputs. As described, beyond the sag point, chain growth and anti-squat are reduced to near zero. The drivetrain is effectively decoupled from the suspension as CVA moves deeper through travel, allowing the suspension full freedom to absorb impacts and track terrain. This keeps the suspension sensitive and fully active while descending. Furthermore, we tune the leverage ratio throughout the suspension travel, to elicit better performance from our shocks. With a relatively higher leverage ratio early in the suspension stroke, our CVA design transfers more force from the rear wheel to the shock shaft in the early stroke. This keeps the system hyper sensitive to small bumps, allowing the rear wheel to stay smoothly in contact with the ground. Leverage ratio: the ratio of rear wheel suspension travel to shock stroke; e.g., if a bike has 5” of suspension travel and the shock stroke is 2.5”, the average leverage ratio is 2.0. Deeper in travel, the leverage ratio is slightly reduced, which adds supportiveness to the midstroke. Less force from the rear wheel is transferred to the shock shaft, allowing the shock to fully support the rider’s weight. This lets the rider pump and push against terrain without the bike moving too far into travel. In the end stroke, the leverage ratio curve ramps up just enough to transfer more force to the shock. This overcomes the natural ramp-up of the air shock and gives us perfect end-stroke progressivity. Result? A bottomless feel under big hits and hard landings. Kinematics: the collective design concepts and parameters that affect suspension, such as anti-squat, leverage rate, instant center, and more. As CVA cycles through travel, a virtual or “instant center” of rotation around which the rear axle rotates migrates fore and aft, but always remains far out in front of the bottom bracket and relatively in line with the direction of chain pull. 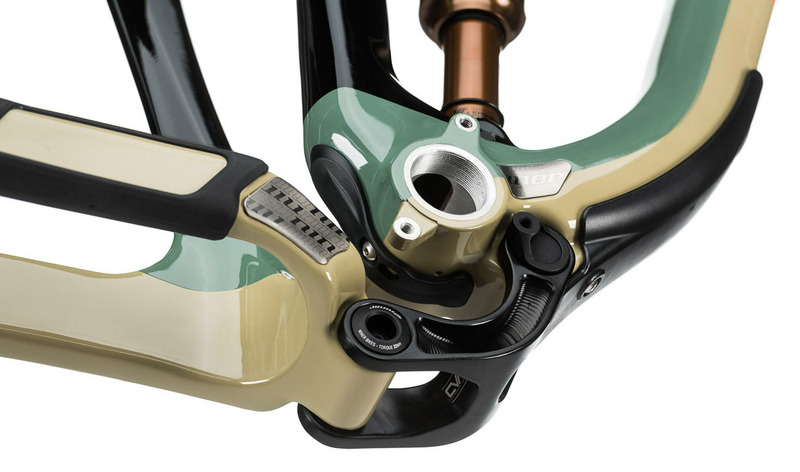 Keeping the instant center well in front of the BB keeps the suspension behavior consistent across a range of different gearing choices, especially early in the suspension travel. By subtly adjusting linkage pivot locations, we adjust the kinematic to achieve desired behavior in each phase of the suspension travel. 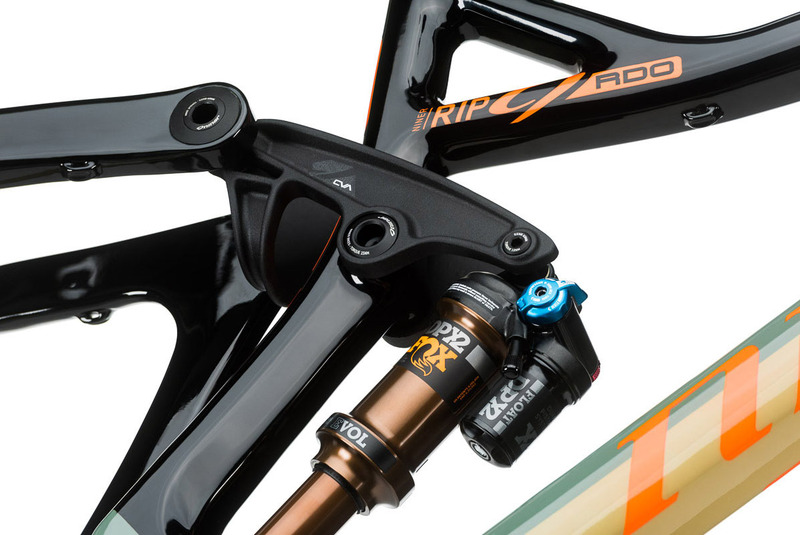 Each bike family (RKT, JET, RIP) gets an overall kinematic to suit the purpose of the bike. We have great control over suspension behavior based on pivot layout alone, giving us more freedom to optimize shock tuning for descents. The CVA system does not rely heavily on shock tune to control pedal bob. So, we can dial our tune for consistency and control on the downhills. Another CVA benefit: the relatively low average leverage ratio reduces the amount of shock air pressure needed to support rider weight and we use a longer shock. There’s more oil in longer shocks, which translates to more consistent, smoother, more effective damping and better reliability. The result is total control, consistency, and ground-gripping traction in all situations. The rear wheel on a CVA-equipped Niner effectively tracks the ground under full pedaling load going uphill, transmitting 100% of the rider’s effort into forward progress. And with optimized kinematics for bump inputs through every phase of travel, plus the smooth shock actuation, CVA is a terrain-tracking missile going downhill. Niner’s CVA suspension system was designed in-house, has been used on Niner bikes since 2008, and was granted a US Patent in May 2011. The system was awarded a Eurobike Design and Innovation Award in 2012 and has earned rave reviews from riders, product testers, and athletes around the world. The ultimate goal of a suspension design is simple: to keep the rear wheel in contact with the ground and moving as freely and independently as possible in all situations, yet control and minimize unwanted, inefficient movement. Niner’s CVA is proven to do exactly this. To test ride one and see for yourself, click here to find a demo near you!